A page is just like a post except it is not in the chronological flow of the posts. Pages are often used for About or contact information. Blogs that are setup as school websites often uses pages as these can be organised into groups and hierarchies. Click on Site Admin in the sidebar of your blog. Pages are edited in the same way as posts and support the same features, you can add ,links, embed images and meda etc. When you are ready to publish the page you do it in the same way as for posts, you click Publish. These can help organise your pages and structure your site. If your site supports pages in menus it may display child pages under the partent in drop down menus. Templates may be avaliable, depending on theme, thart will affect the appearance or layout of a page. 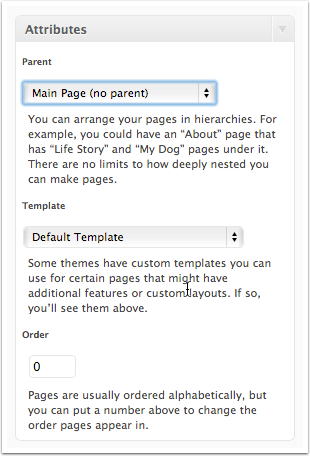 The order will affect the order of pages in the list, if you add the Pages widget or in menus if your theme supports them. Like posts pages support commeting, it may not be appropriate to have comments on pages and you can turn them off at the bottom of the Page Editor.